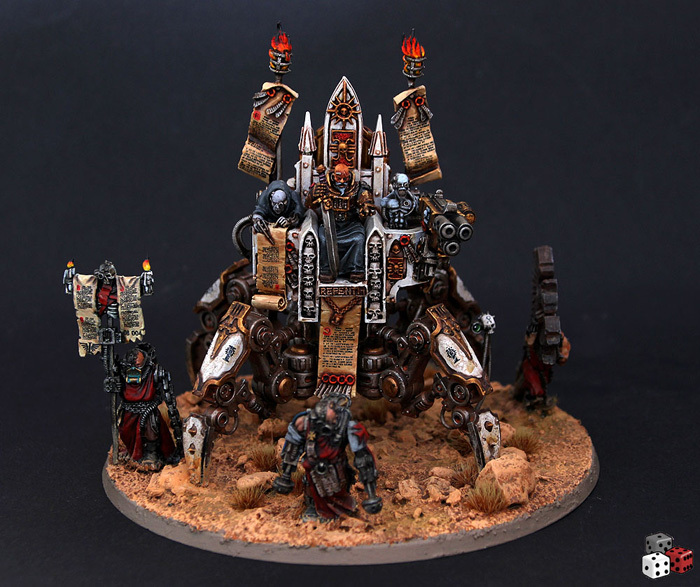 There are some models which really transport the whole dystopian/over the top medieval/gothic atmosphere of Warhammer 40.000. One of it for me is Inquisitor Karamazov on his Throne of Judgement. The original model is already pretty nice, but I felt I could push it a little bit further. 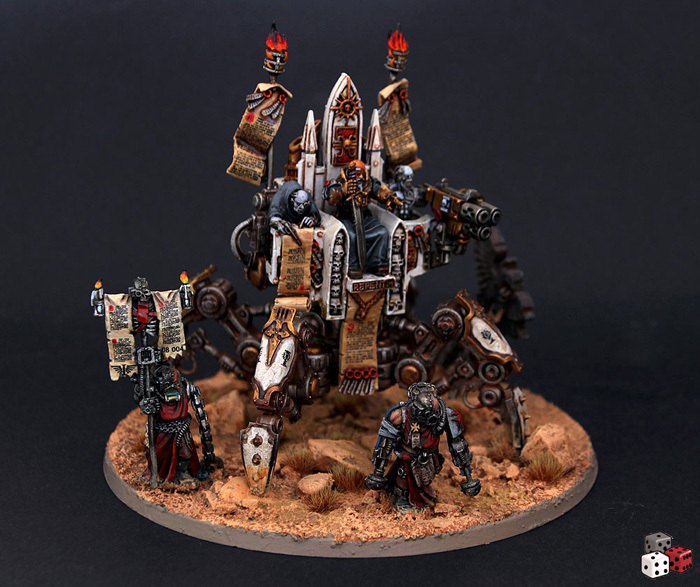 Therefore, I swapped the dreadnought legs for the spider legs of an Onager Dunecrawler and added three footsloggers (Cenobyte Servitors from Black Templars Chaplain Grimaldus) an a little servo-skull. I really like your conversion of old Karamasov. For me the original model with the Dread Noughts legs never really worked. 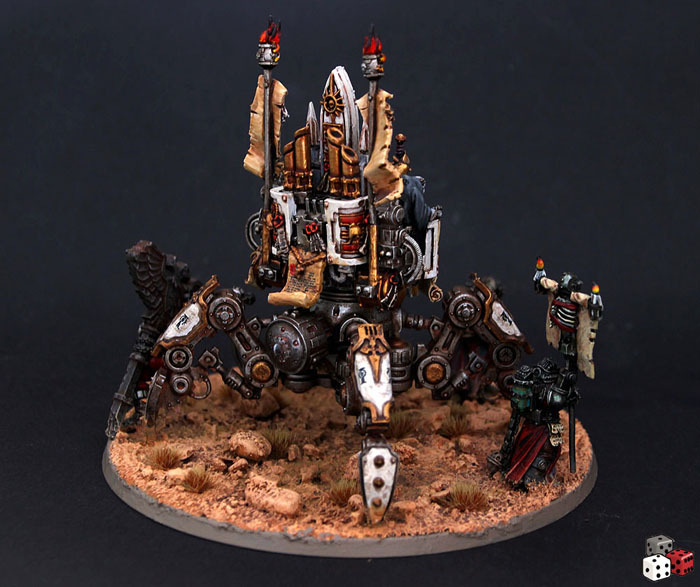 The disturbing crablike legs of the Onager really make it work for me. My compliments! One thing in addition: the reddish recess shading on those legs pulls the Cenobites into the overall composition. I think I would not have come up with that. A really great model. Thank you for sharing! Oh, excellent! The quad approach makes him look much more solid and intimidating and regal. Brilliant work! Like the others, I also think the quad legs work better than the originals. Must be smoother riding for Karamazov as well! 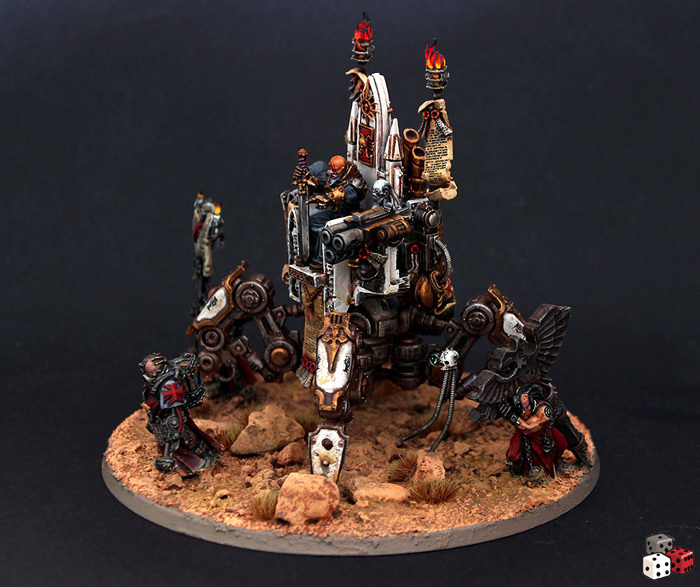 I'm glad you ended up with the servitors and the desert base instead of your original ideas: the base is just more 40k, dystopian as you said, and while the feudal IG is a cool idea, the models' proportions are a bit too wonky. And the servitors just fit the theme too well! Yes, sometimes it is worth trying different alternatives. Well done Sir. The changes definitely fit with the "feeling" of 40k and that's a big thing for me. Not just changing something to be different. What a fantastic revision of the original model! The extra bulk (and extra legs) work like a charm! The WIP Inquisitorial troopers are looking very promising as well!